DeWalt Cordless Screw Guns are known for their highly innovative features. DeWalt offers a wide range of screw guns with different sets of features for different purposes. So, whether you are a professional or an amateur, you can easily find a cordless screw gun that meets your expectations. Let us take a detailed look.
.	Dual speed range - two different ranges of speed - low speed for decking applications and high speed for drywall applications.
. Fan cooled high performance motor which is powerful and durable.
. Unique VERSA-CLUTCH torque adjustment system for better performance.
.	Anti-slip grip for improved control and comfort.
.	Powered by high quality batteries which can be recharged very quickly. The dual speed range feature is something that has caught the attention of everyone who has reviewed DeWalt cordless screw guns. They have mentioned that the high speed range is very useful for drilling holes and the low speed range is useful for driving screws and nuts. Some reviewers say that if you have used corded screw guns all your life, it might take you a while to get used to the slower RPM of these guns. There is a speed chuck feature available, but most of the reviewers are of the opinion that it should not be engaged in high speed. They say that it might hurt your hand. So, that is something that you need to keep in mind if you are using these cordless screw guns. DeWalt Screw Guns are usually very sturdy. This is something that has been highlighted in most of the reviews that I went through. The reviewers say that they have accidentally dropped their screw gun a lot of times and it still works fine. 'Built like a tank' is an expression that some reviewers have used to describe these screw guns. So, I guess you can imagine just how tough they are. The guns, particularly the 18V ones, are a bit heavy, but not too heavy to stop you from using them all day. 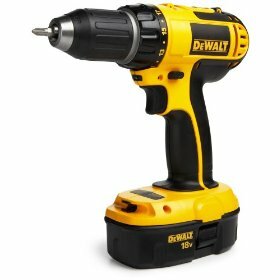 The only problem with DeWalt screw guns, according to some reviews, is their battery life. They say that the battery life is short and the batteries are a little bit expensive as well. However, they also say that some models offer better battery life than other models. So, you need to do your research before you buy one. Apart from battery life, everything else seems fine with DeWalt screw guns. Going by the reviews, which have been mostly positive, it can be said that these screw guns are a good choice for your home repair and construction needs. Return From DeWalt cordless screw guns Page to Home - Finishcarpentryhelp.com.